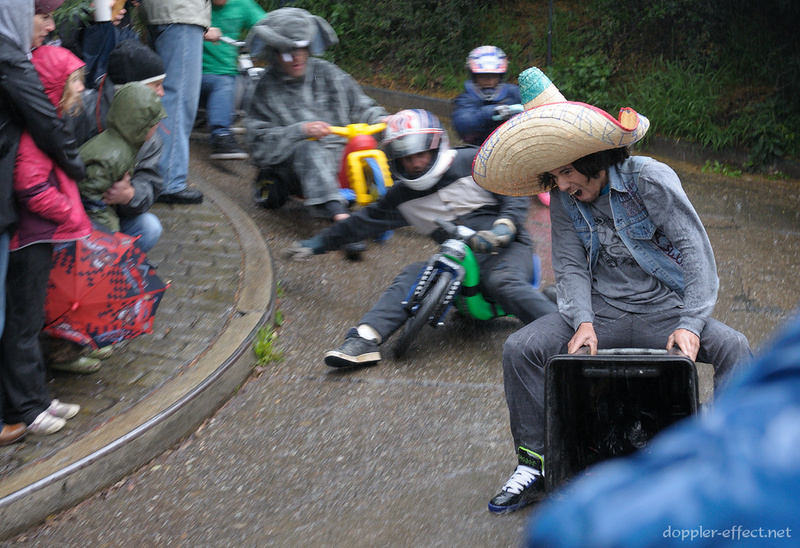 This was the second year that Bring Your Own Big Wheel went down Potrero Hill, and the first that it did so in the rain. 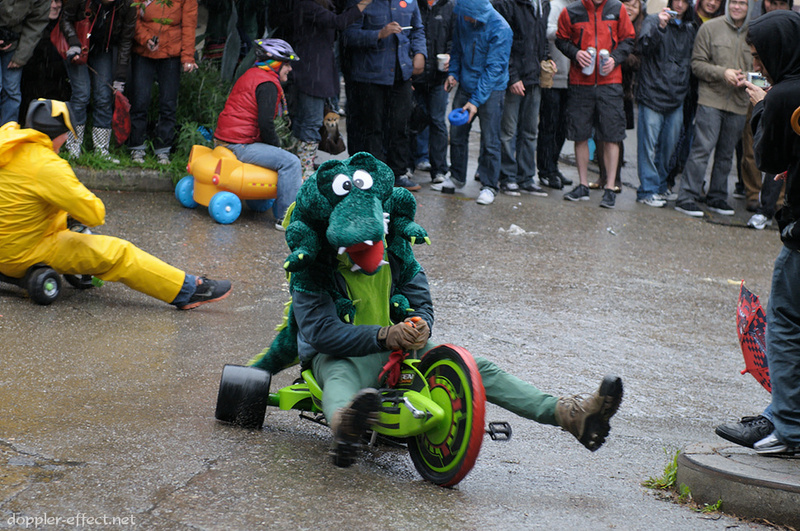 As might be expected, the weather further reduced what little braking and steering effectiveness the riders might have mustered in the dry, and as a result folks went faster and, inevitably, crashed harder. 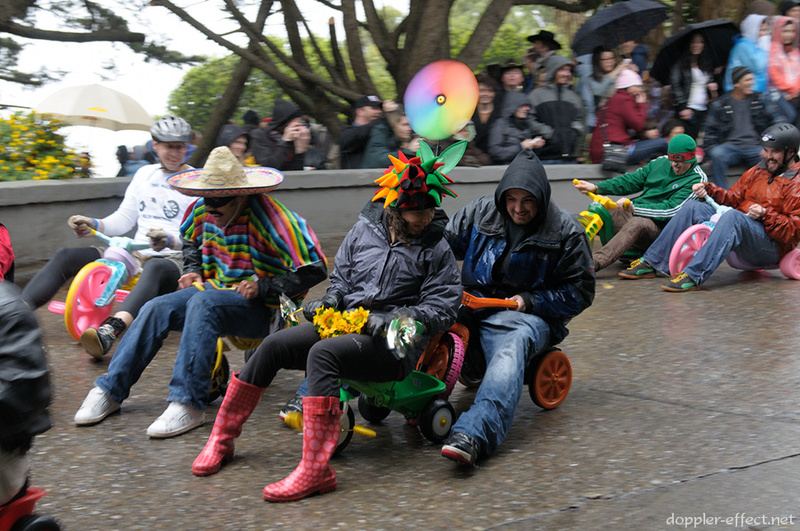 Even so, the rain and wind didn't stop participants from going balls-to-the-wall with both their costumes and their "big wheels." Pictured above is one of the crazier vehicles I spotted during my short stint this year. I suppose if the carpet dolly tipped over, the guy would just drop onto the saucer sled and keep going with no real reduction in control? I'm not entirely sure, but it was definitely fun to watch. 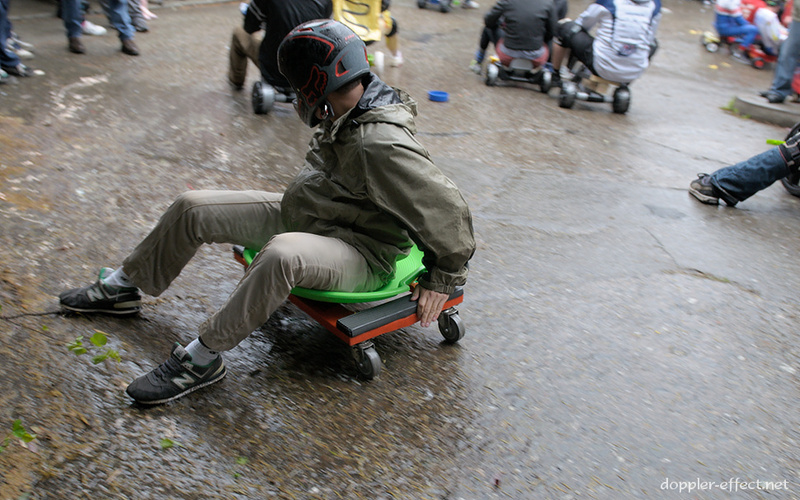 The similarities between BYOBW and Mario Kart are obvious — multiple Marios and Luigis were in attendance both last and this year. This was, however, the first time I saw someone with actual technology from the game. Somewhat appropriately, this guy also had a red shell which he lost (that is, "avoided") during an earlier run. And this person was apparently demonstrating what happens when you "find" a red shell in the middle of the course. 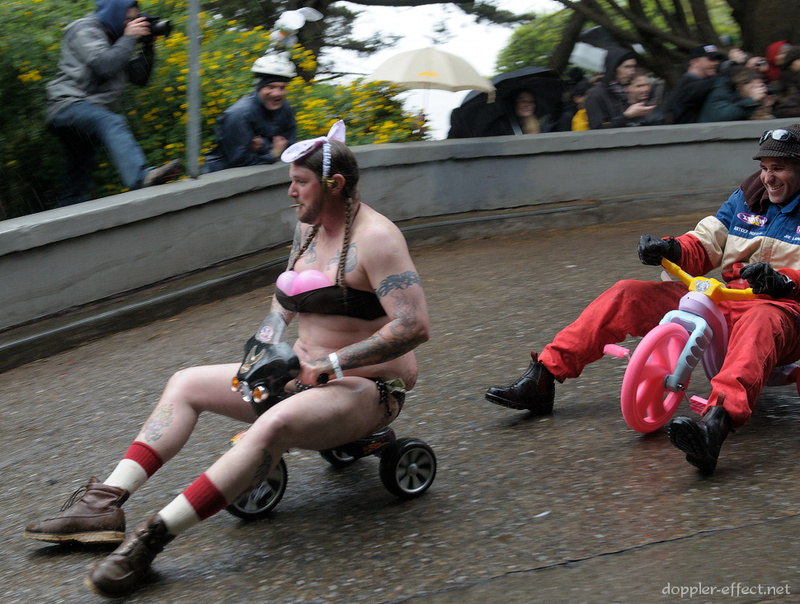 In actuality, his/her big wheel had a pretty severe case of oversteer, and basically liked going backward more than it liked going forward. This was especially comical since the alligator costume obliterated any potential for peripheral vision, and thus, any potential to still figuring out which way didn't end with more tumbling. 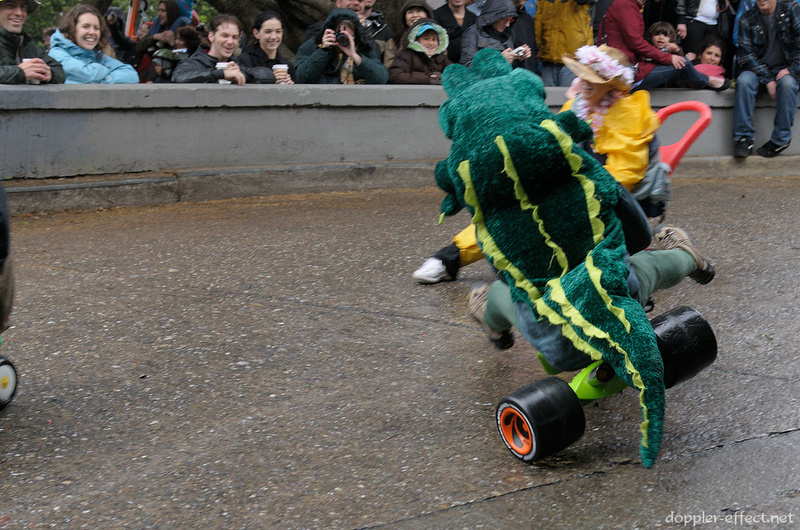 "Ooh, pretty" was not a thought I expected to cross my mind during BYOBW, but what can I say? I like colors, and the fan/color wheel concept was pretty neat. Of course, the shape and location of the entire color wheel attachment remind me of the Petey Piranha character from Mario Kart Double Dash, who will always be associated with loud, repeated complaints, composed nearly entirely of profanity (see xkcd), about his height and how he apparently always blocks your view when he's driving in front of you. I'm pretty sure that's the same reason why the guy with the orange and pink wheels ran into her. Either way, stay classy, Beast. Speaking of class… Every year, there's someone who draws your attention despite your best efforts to look away. Last year, it was the Roman "tighty whitey" warriors on their razor scooters. This year, I'm pretty sure it's this guy. He's lookin' good and the bill in his bikini bottoms lets you know he means business. Really, everything you need to know is written on the face of the guy behind him. And somehow, we end where we began. 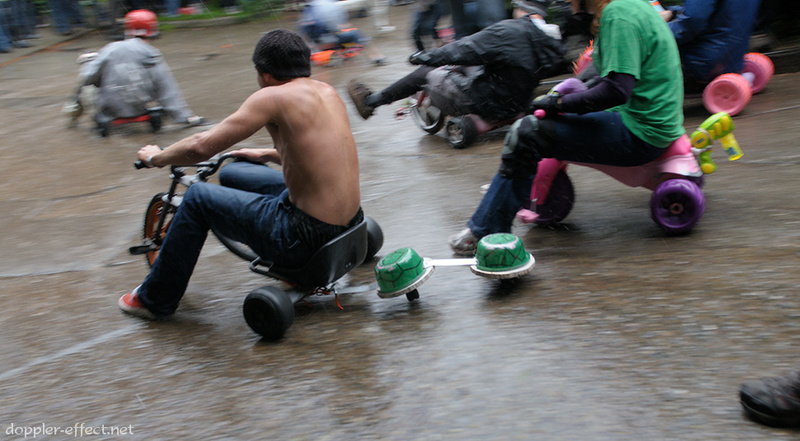 Those of you who read last year's BYOBW post, "Kid Tested, Mother F'in Approved" will recognize the gentleman pictured above. Much like Oscar the Grouch, he is inextricably linked to the concept of trashcans in my mind. Thankfully, this year he did not disappoint, and showed up atop his traditional style of big wheel.